Originally uploaded by Axel Larsson. 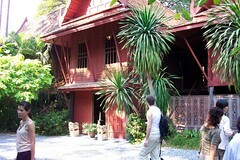 This is the outside of Jim Thompson's (of Thai Silk Company fame) traditional Thai house (no photos allowed inside). I'll be posting more pictures of the trip to this photoset on Flickr.